Infoblox's Americas Partner Summit highlighted opportunities for partners in security, cloud and subscription-based offerings. INFOBLOX AMERICAS PARTNER SUMMIT — Infoblox is spreading the word far and wide that its focus goes beyond core network services and includes security, cloud and subscription-based offerings. That’s according to Lori Cornmesser, the vendor’s vice president of worldwide partner alliances. 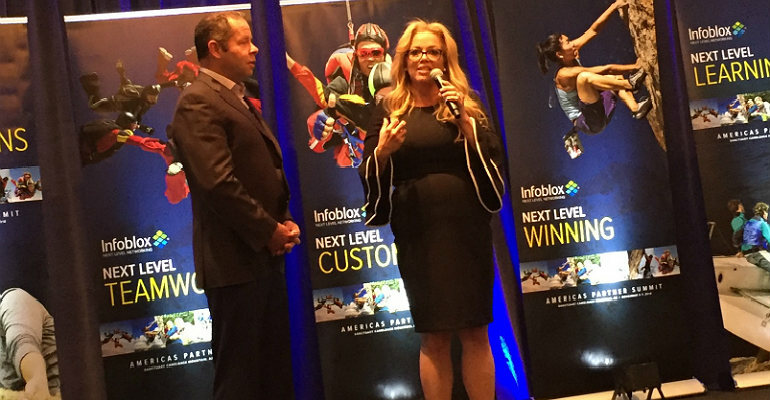 During the first day of Infoblox’s Americas Partner Summit, she shared market opportunities and outlined her company’s partner strategy and what partners can expect in fiscal year 2019. The theme of the conference is “Next Level Partnering.” Last month, Infoblox rolled out its expanded global partner program, which rewards partners for their investment in accreditation competencies such as network, security and automation. Partners who invest in certifications and training receive increased benefits. The purpose and vision for the conference was to make sure partners know there’s an “expanded opportunity in the ways and solutions that partners go to market,” Cornmesser said. Infoblox wants to be the “vendor of choice,” and part of that means “we need partners to think about us in those solutions and where they complement, but also lead with us,” Cornmesser said. For fiscal 2019, Infoblox plans to add more value to what partners are selling, more opportunities around professional and managed services, more recurring revenue opportunities and more customer “mindshare,” “by transitioning from an add-on to an absolute imperative,” she said. “You’ll hear a lot about our contributions to SaaS and subscription-based offerings,” Cornmesser said. When it comes to security, Infoblox has a “really compelling message” about where it fits and how it differentiates, Cornmesser said. Some $20 million of the company’s business is in security based on deal registration, with the Americas driving about 60 percent of that, she said. Among its goals for fiscal year 2019, Infoblox pinpoints 1,100 new partner pipeline opportunities per quarter, and 5,750 partner accreditations. Bill McCarthy, Infoblox’s executive vice president of worldwide field operations, told partners his company experienced 15 percent year-over-year growth in revenue in fiscal 2018, and the company is making “big pivots” in security, subscription and cloud offerings. Ninety-five percent of the company’s business is driven through partners, he said. Infoblox closed out its fiscal 2019 first quarter on Oct. 31 and the growth was “explosive,” he said. Philip Puccio, founder and CEO of Elevi Associates, an IT product, services and staffing firm, said his company attended the partner summit to find out where Infoblox is going and its strategic shift with adding security “as one of our three core competencies.” He said he also was there to relay information back to customers. Empowered Networks, an Infoblox partner for about nine years, is a VAR and “niche SI” that specializes in monitoring and management tools for next-generation networks, said Brian Hepburn, its CEO.